It is with a big sigh that the end of March approaches and I count up the things I had intended to do before the month ended. Gladly, one of the few tasks I have ticked off my list is this post on my St Patrick’s Day dinner. It wasn’t fancy or green or colourful or shamrock-filled but it was mighty tasty. 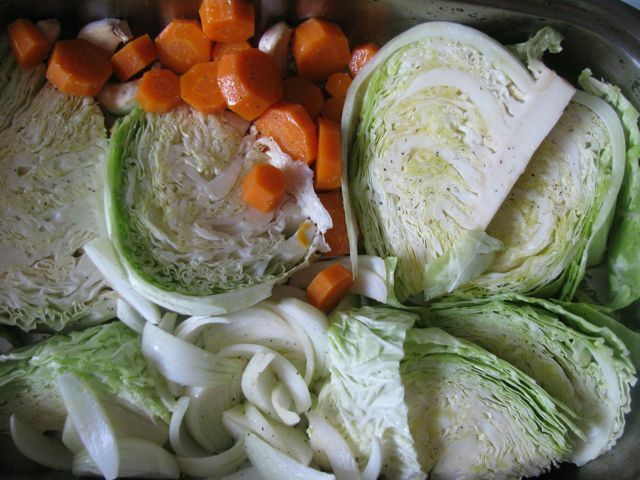 I was initially inspired by Kalyn’s roast cabbage. I have roasted many veg before but never even considered cabbage. Cabbage is good bog-Irish food. I love it in stews and soups but am often a bit uncertain of its merit on its own as a side dish. This seemed an excellent way to cook it and so I decided I would try it on St Pat’s Day. 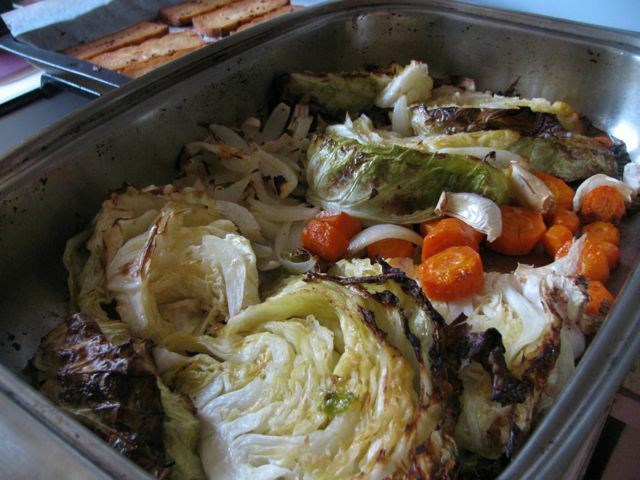 A generous hand with the oil and seasoning resulted in cabbage that was soft but slightly charred around the edges. I loved it. E wasn’t so keen. When I roasted the cabbage I threw in a few carrots, garlic cloves and onions. I had lots of vegetables leftover so the next day I used them to make a version of this roasted vegetable pasta that I make every now and again. I highly recommend it for the roasted cabbage if you are wondering how to serve it. There was only enough leftover marinated smoked tofu for a sandwich the next day. A sign that the marinated smoked tofu was superb even if we couldn’t agree how appropriate it was for an Irish meal. E laughed at the idea. I felt it wasn’t so silly as it sounded. 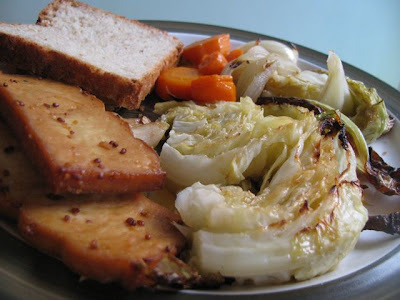 Being a vegetarian means I would not could not cook some of the traditional Irish meats such as corned beef beside the cabbage or bacon bits through it. Since becoming vegetarian I have come to appreciated that it is the smokiness rather than the pigginess that I once enjoyed in bacon. Hence, my choice of smoked tofu. I chose honey and mustard as flavours for the smoked tofu marinade because I could imagine them being used in Ireland with meat. I found a recipe for honey mustard glazed chicken and adapted it. I was really pleased with the flavour. Even Sylvia had a little taste. It seemed like I had unwittingly hit on a marinade that was a little similar tasting and as delicious as the one used in the vegan breakfast at CERES. (Of course it is not vegan with the honey in the marinade but I think maple syrup might be a fine substitute). 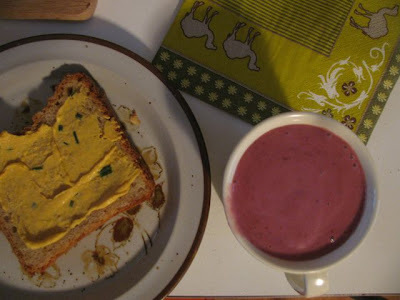 Remembering the breakfast at CERES, I thought of my beetroot and orange chutney. I dolloped a spoonful onto the tofu (after the photo). It was just what the mean needed for a finishing touch. I had planned to make potato and quinoa cakes to go with the spread but in the end that was too ambitious. As I had made a honey and oats no knead bread that day, it seemed enough to have a piece of bread with dinner. It made an excellent smoked tofu sandwich too. I had intended to post the bread recipe here but that was also a bit ambitious. It will be up soon. I am not sure what St Patrick would have thought of my meal but I thought it a nice modern vegetarian take on an Irish dinner. 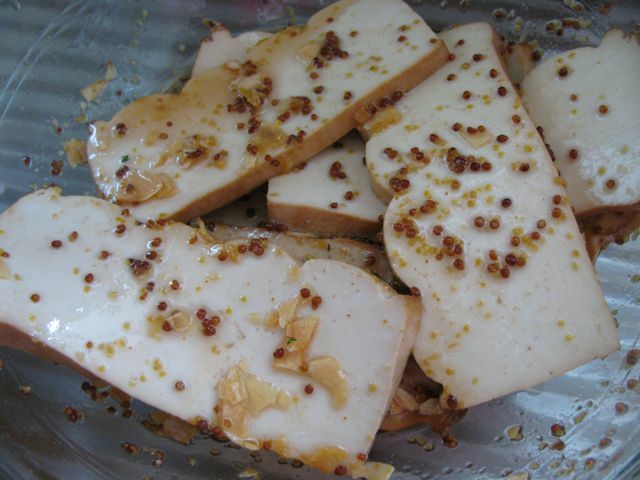 Make marinade by mixing all ingredients, except smoked tofu. Place tofu slices in a shallow dish and pour marinade over it. Leave to marinate one hour, pouring marinade over every now and again. I baked it for 45 minutes on the bottom shelf of the oven at 220 C. It is done when the marinade is mostly soaked up but still a bit sticky. The tofu doesn’t get very crisp, just slightly brown. Cut cabbage into about 6-8 wedges. Arrange in a roasting tray. Drizzle with olive oil and season with salt and pepper. Add any other seasoning you fancy, garlic, chilli flakes, smoked paprika, lemon juice. NB Kalyn suggested leaving the core in each quarter to keep it together while cooking. I followed this advice and was not sure if it was the best way to roast it or not. I roasted the cabbage at 220 C for 45 minutes, turning over once. Kalyn roasted hers for 15 minutes on each side at 230 C. It is done when the cabbage is soft and slightly wilted but crispy and even a little charred o the edges. 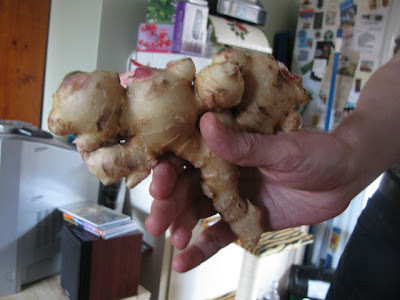 This is excellent as a side dish or in soups, pasta and stews. There’s a lot of recipes in my recipe index. So you might want some guidance? What are my favourites? What do I recommend? Sometimes you need comfort food that doesn’t take much effort and can use up whatever in the fridge. Many of these meals also make great leftovers and freeze well. I am no nutritionist but have picked out some snacks I love that are seem to be low in sugar and fat and high in nutrition. 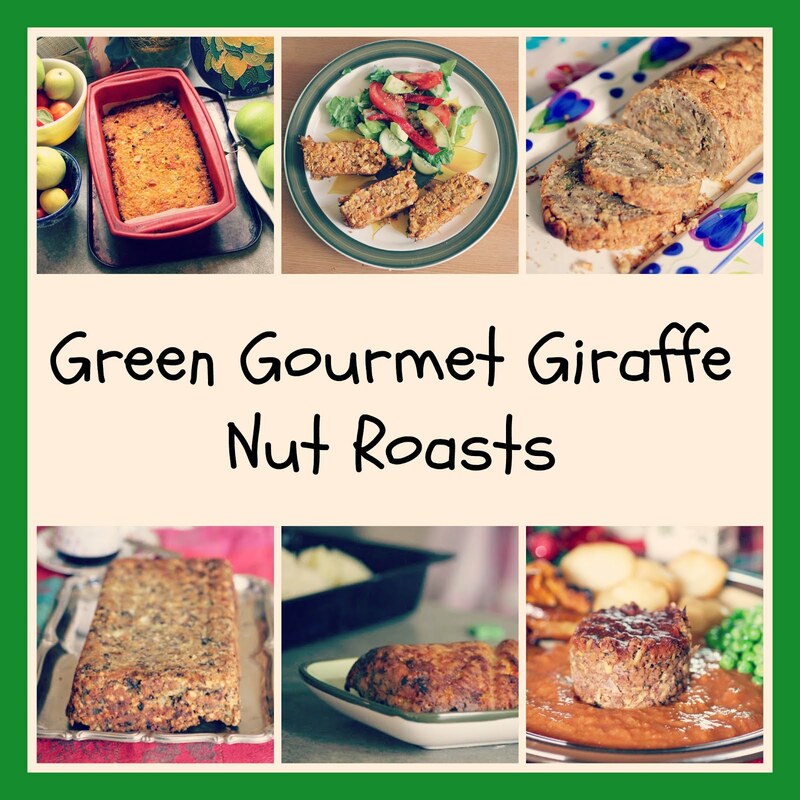 These are great for entertaining, for kids and for lunches. Of course if you really want to be healthy, fruit smoothies, fruit salads and crudités and dips are a good start but these are a bit more indulgent, albeit not very sweet. 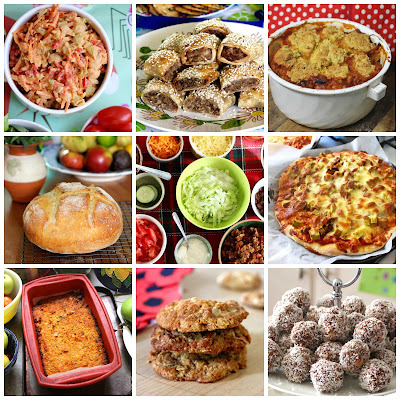 There are lots of savoury recipes on my blog that are gluten free. Indian food, Mexican food, risotto, stews, dips, soups and salads are all obvious places to look. 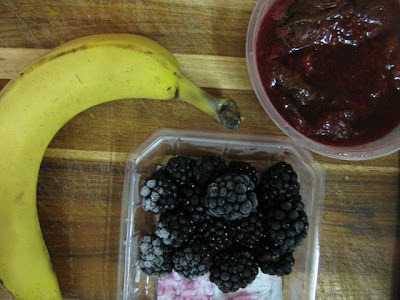 Fruit salads and fruit soups are easy GF desserts. 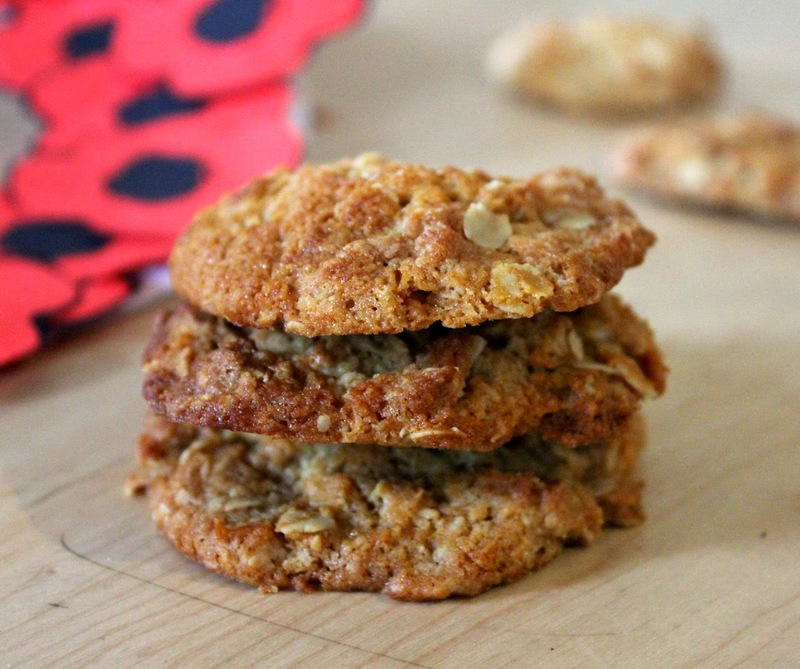 I am sharing some of my favourite forays into GF baking here. A few recipes here aren’t technically baking but they all fit into the substantial desserts, cakes and quickbreads category that can be a challenge for a GF diet. Tradition is important for me with food, especially finding vegetarian traditions to replace those I had with meat. Here are recipes I make each year on days of feasting and remembrance. Cheese and Walnut Nutloaf – I make this every Christmas and have it in place of turkey. 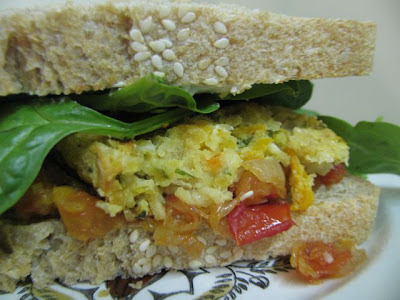 It has simple flavours, is easy to make, and slices thinly for leftovers sandwiches. Chocolate panforte– I made this a few times last Christmas and it was a great food to share with family and friends and to give as a gift that is full of dried fruit. Hot Cross Buns - Easter eggs and hot cross buns hit the shops too early each year but come Good Friday, hot cross buns are a must in my house and they taste so much better when made at home. Vegetarian Haggis (v) – In Scotland it is easy to buy vegetarian haggis for Hogmanay but in Australia it is rare as hen’s teeth. I was pleasantly surprised how easy it is to make and E loves it at New Year’s Eve each year as a little reminder of home. Gekkazan (CBD) - a favourite place to lunch in the city (next to the old GPO). Not the cheapest sushi but I love the roll-your-own and it is a nice place to sit down. 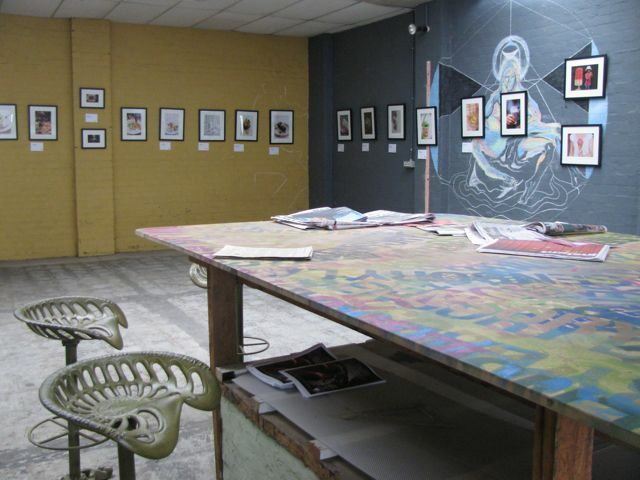 Glass Den (Coburg) - a hipster cafe in the old Pentridge Gaol gatehouse with lots of interesting vegan food. Last year the idea of a food bloggers conference got wheels and an amazing amount of work went into making it happen last weekend. I was excited to get one of the golden tickets to attend and sorry it happened at a time when I am struggling to find time to read other blogs and on a weekend that I was particularly time-poor. There were some frustrations on the day but in general it was a pleasure. I am a compulsive note taker and consulted my scribbles to give a run down on the day. Firstly, I find these big gatherings of people overwhelming. It didn’t help that I seemed to be last to arrive and first to leave due to having to schedule it around looking after Sylvia and organizing to go to Sydney the next day. It meant I couldn’t even stay for dinner. It didn’t help that I am not on twitter and couldn’t see the screen so I felt even more on the periphery when everyone was giggling at the screen listing the tweets. It didn’t help that there wasn’t a list of bloggers attending beforehand that I could read to compensate for my limited reading of local blogs (if I could have found time). Those grumbles aside, it did help to see some friendly familiar faces, to share good food and to be involved in some stimulating discussion of blogging. 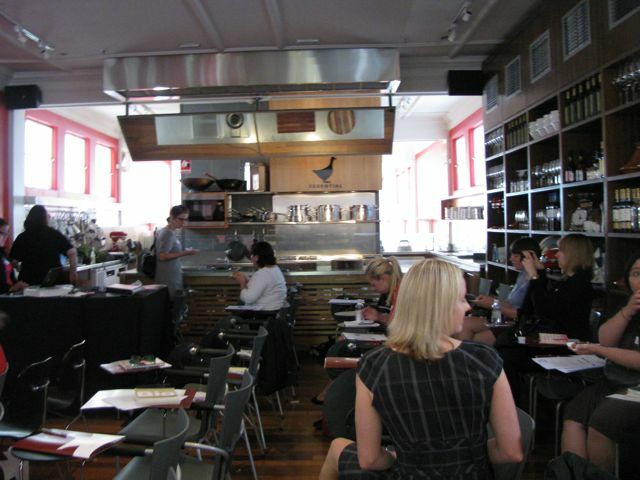 Forty-five bloggers gathered at the Essential Ingredient at the Prahran Market in the upstairs cookery demonstration room upstairs. The walls were a warm red and covered with shelves of wine glasses, stockpots, stacks of plates etc. Just the sort of place to make a food blogger comfortable. Tammi was a fantastic MC, keeping us to time and facilitating everyone to join in the discussion. AOF described her blog as a ‘cooks journal’ and gave us her top ten tips for blogging. Reem discussed blogging as a way of expressing herself and developing a community of interest. Zoe took this idea further and described her blog as a way of marrying her loves of two crafts: writing and food. I loved her discussion of how food and blogging transform the solitary nature of writing into an interactive communal activity. She echoed my feelings too when she said that professional food media fails to provide what she wants to read. 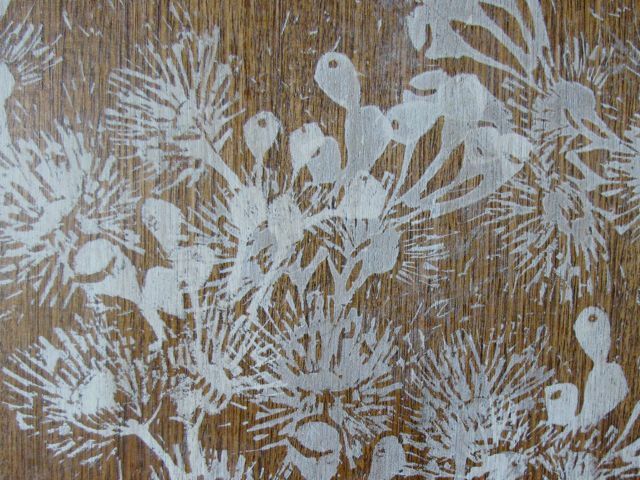 An interesting discussion followed with some other interesting reasons to blog – to let your mum know what you are eating, to created your space which was compared to a man in his shed, as catharsis and to create a resource. I am not much of a photographer and some of the technical language here was a bit above my head. I still don’t understand ISO though the discussion did make me dream of having an SLR camera. I did manage to visit the photography exhibition at St Ali which demonstrated the amazing talent with which some bloggers wield a camera. What I enjoyed on the day was hearing some of the quirky things people do. Ellie entertained us with her stories of checking the light in every room in her house for food photography and making enough to have extra food over to photograph at the end of a meal (which she then ate for lunch the following day). She also gave excellent advice including finding inspiration by looking at how others plate their food. Nola reinforced what an amateur photographer I am when she talked about her training as a photographer beginning with 4 weeks of photographing a tennis ball! Matt’s discussion of his approach to photography was interesting but I was most comforted after seeing the high quality of his photos to hear that he coped with a messy kitchen by just keeping it out of focus. Now that is a reason for me to hone my photography skills! Claire discussed the new US Federal Trade Commission Guidelines on endorsements and how they might affect bloggers as well as some of the ethics of freebies. Disclosing a connection seems common sense but she pointed out some of the pitfalls. Ed discussed more legalistics with the sound advice to not be scared by intimidating lawyer’s letters. The issue of libelous comments was also discussed. Penny talked about social networking and the intersection between virtual and real worlds. Michael gave some useful tips on thinking about how to get more traffic by understanding how Google searches work and using Google adwords to find out what readers are seeking. Brian discussed the appeal of content sorted by locality rather than date. I found his ideas about what the future of blogging might bring fascinating but I am curious as to how content by places can be organized to ensure it is still up to date. Jules gave an interesting talk about how she was using publications and affiliate links to support herself through blogging. I was amazed to hear that she was doing this without any advertising. It sounded like a wise decision when hearing Phil tell us that blogs are too small to interest large advertisers. I had to leave during his presentation (sorry) so am not sure if I missed any gems of wisdom. 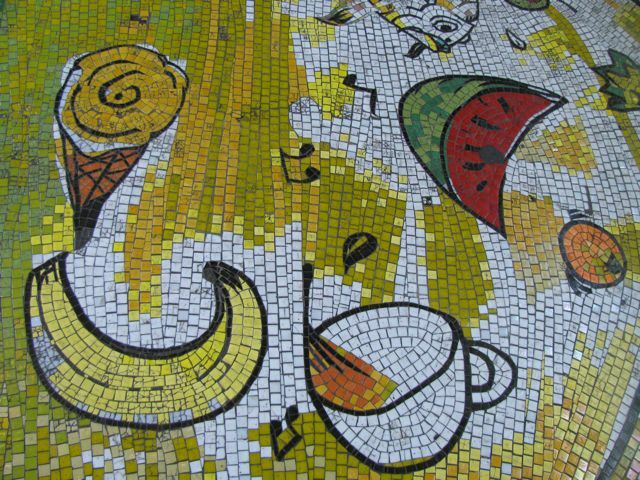 Reviewing cafes and restaurants. What is fair? Should photos be posted that show the food in a poor light? Should this task be left to the ‘professional’ journos? I will add that I always feel that the term ‘review’ does not sit easily with me for the connotations it brings to mind. I would like to have another term - maybe a tasting journal (thanks AOF) that goes alongside my cooks journal. One of the benefits of blogging is learning new skills, whether they be related to writing, photography or technical issues. One of the great things about blogging is the diversity in bloggers and blogs. Although some presenters naturally advocated for their approach, it was balanced by a diversity of opinions of the importance of photos, rankings and making a career out of blogging. I dare to hope we might have another conference next year and I might attend again. Some suggestions for improvements are provide a morning tea, have some small break out sessions, provide alternative ways to enter competitions for those who aren’t on twitter, holding the photography exhibition at the conference venue, and circulating more information prior to the event including a list of attendees would be helpful. 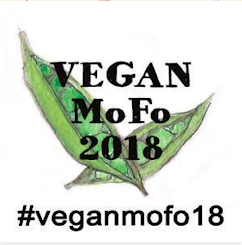 I also liked an idea I heard recently of a team building exercise where everyone cooked together and thought how great it would be to do this at a food bloggers conference and then sit down to share the food we made (all vegetarian in my vision of course!) However, I appreciate all the work that went into this by bloggers with day jobs and busy lives so these are suggestions rather than complaints. More of all the good things I have listed in this post would also be welcome. Finally, this is a food blog so you probably want to know what I ate. A fridge full of drinks kept us hydrated all day. Lunch was sandwiches from St Ali (read about my visit to St Ali). They were delicious with amazingly good bread and roasted veg but I must protest at the lack of protein. It was also a shame that some missed out on sandwiches due to everyone assuming there was a bag each but we found out later that the two sandwiches per bag were meant for two people. Best of all were the fantastic cakes after lunch. 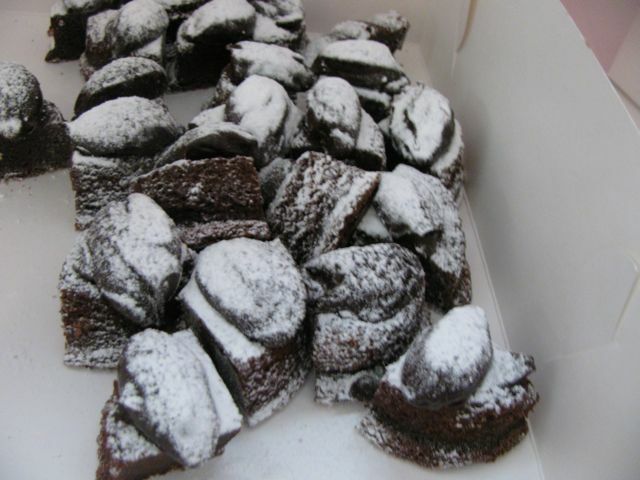 Dense fudgy chocolate cake, meltingly light buttery flaky apricot pastries and other fine fancies came in boxes that stayed temptingly close to me during the second half of the day. And it was all free thanks to the hard work of the organizers. Many links to sponsors and posts on the conference from other bloggers can be found at the Eat.Drink.Blog website or you can read a mainstream commentary at The Age Newspaper. Reorganising our home seems to be an ongoing project. Every now and again it gets a new burst of life with a visit to Ikea. Just a few weeks ago we went to Ikea and bought a flat pack cupboard. 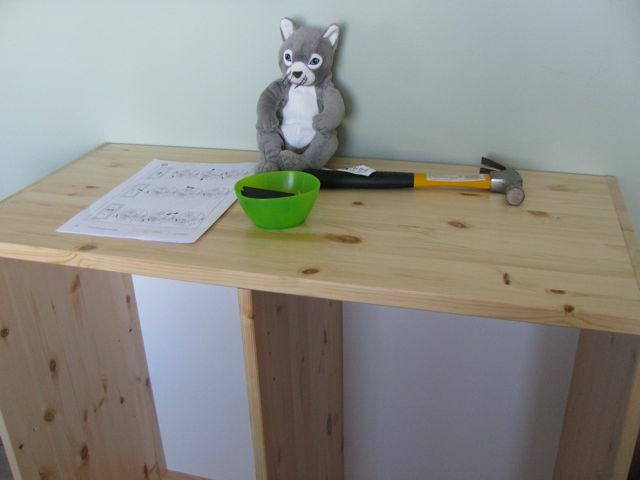 E put it together over a couple of days. 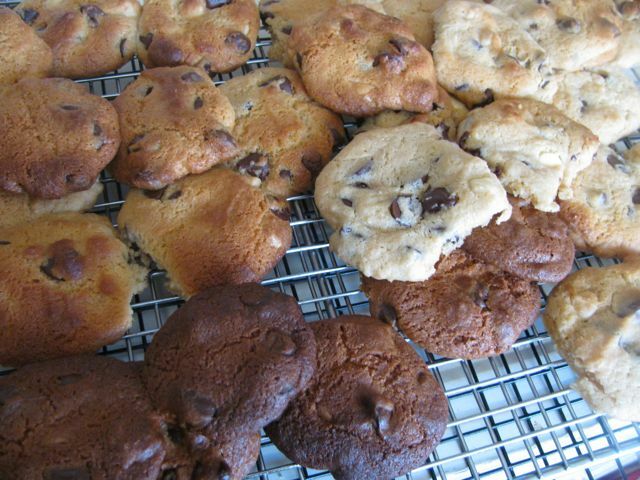 I made some condensed milk choc chip cookies for him as a reward for his work. We find it hard to go to Ikea and not be tempted by bits and pieces. In fact, one piece of the cupboard was missing and I had to return today to buy this $4 item and found myself with quite an armful of stuff we needed. I saw a woman queuing at the check out with only one item and I admired her self-control. We just can't resist a gloomy grey cat or a kiddie saucepan set. 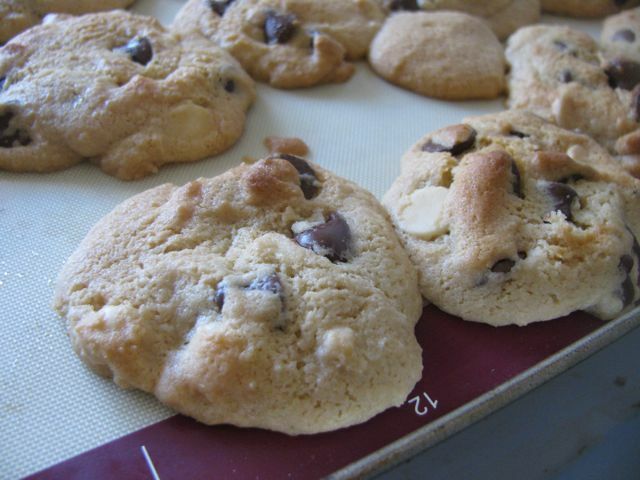 In a similar way, I can't resist a new choc chip cookie recipe. Despite a book dedicated to choc chip cookie recipes, oodles of bookmarks and recipes copied from cookbooks, I still noted the recipe on a condensed milk tin with interest. It was so simple and had no eggs. I first made these quite a few weeks ago when we had a social evening at Sylvia's child care centre. It seemed a good recipe to have in reserve in case my plum muffins didn't work. The child care centre is not only nut free but also egg free as many children seem to have allergies. In the end, I was glad the muffins worked out because I got a little distracted while the cookies were baking. I had foolishly decided not to put on the oven timer for the first batch because Sylvia was sleeping and you can see the result. When it came to the second batch I didn't want to repeat my forgetfulness and so I used the timer. Sylvia slept right through. I try not to tip toe around her too much when she is sleeping, but some days I just don't want any excuse for her not to sleep. These cookies were a bit like the little girl who had a little curl right in the middle of her forehead - when they were good they were very very good but when they were burnt they were horrid. We managed to save some of the less burnt ones by crumbling them over yoghurt and raspberries that had a drizzle of maple syrup added to them. I can highly recommend this rescue remedy. 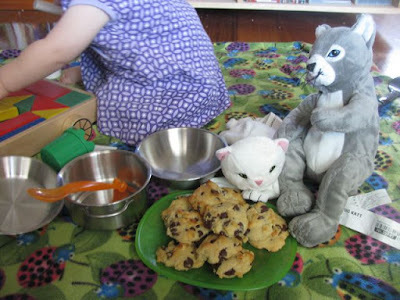 E was also pleased that the cookies didn't go to the social evening. He loved them so much he told me not to worry about dinner, he would just eat 10 of these. They were very moreish and I was glad they could keep well in the freezer so I could keep them out of the path of temptation. The first lot of cookies that I made had butter and I substituted some soy flour and baking powder for half a cup of the self raising flour. They had a more rounded shape and were chewier. The second time I used Nuttalex vegan margarine. I assume it was the butter rather than the soy flour that made the difference. Both times I found the dough too soft to roll them out and flatten slightly as the recipe said. 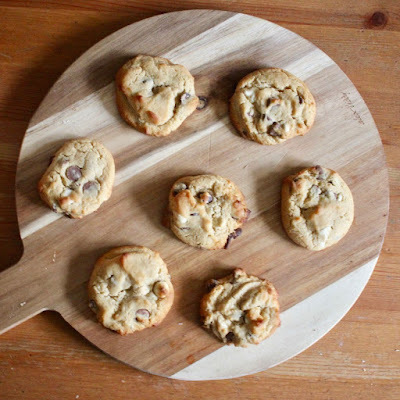 This recipe confirms my belief that condensed milk makes everything taste great but I think my next batch of choc chip cookies might see me reverting to one with oats for a bit of texture and nutritional oomph. 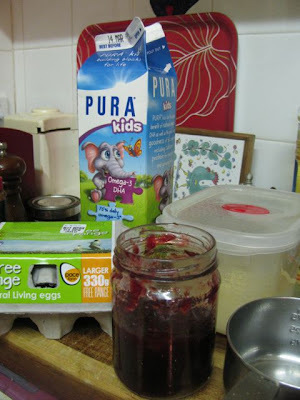 However given that E loves them so much, I suspect there will be opportunities to experiment with this recipe further. Beat butter and sugar til creamy (I used a spoon). Add condensed milk and beat once more till creamy. 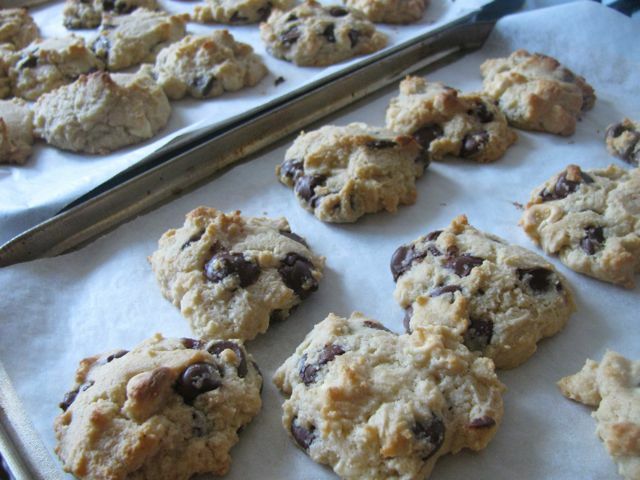 Stir in flour and choc chips til combined. 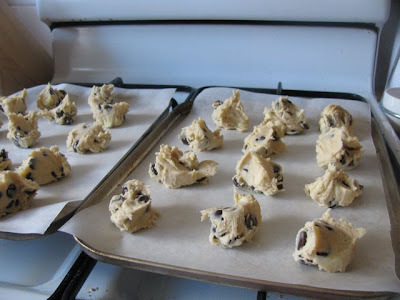 Bake for 12-15 minutes* or until just starting to colour - err on the side of less cooked here rather than overcooked. Leave on tray for about 10 minutes and then transfer onto a wire rack to cool. 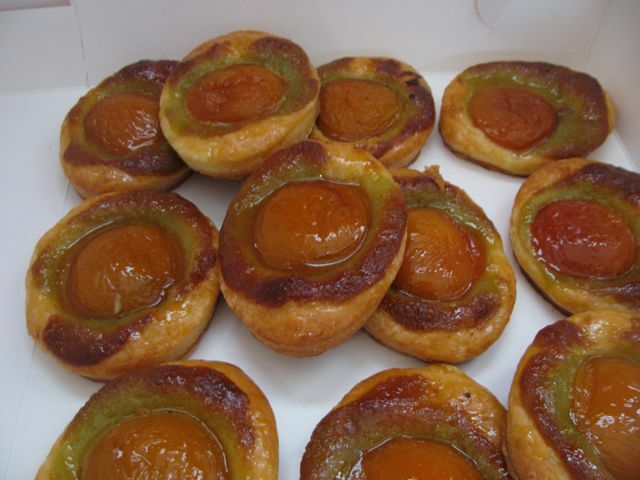 These are delicious eaten warm but they keep for a few days and keep very well in the freezer. Update September 2016 - made these this week and found that 10-12 minutes is probably more accurate for the timing. Even 12 minutes seem to brown them as much as you would want and as my oven is pretty slow this is probably more than some oven's need. They only need a little bit of golden brown around the edges to be done. Update 2018 - We accidentally made these with plain wholemeal flour and don't recommend this. I made another batch and updated the top photo. 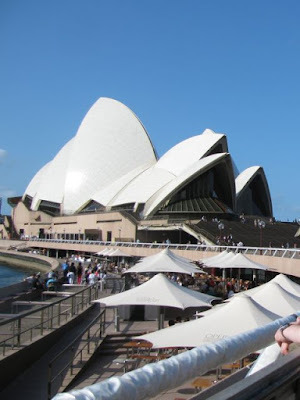 I am just back from a conference of sorts in Sydney and thought I would just post a quick list of what I have learnt. Mostly I wanted to share this picture of a golden gaytime icecream at the Opera House with you. It is not fancy or healthy but it tastes so good. 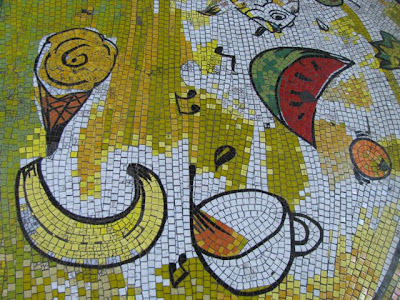 It was my favourite ice cream when I was little and I still love to have one every now and again. E loves them too - they are high on butterscotch ice cream and low on chocolate - just his sort of thing. Even Sylvia enjoyed a bite. 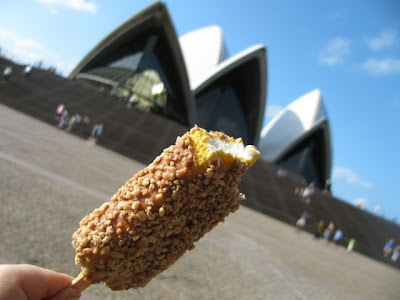 It seems that the old advertisement was right - "it's so hard to have a gaytime on your own!" Sylvia prefers bread, cheese and salad from a sandwich bar to a Hungry Jack's (aka Burger King in other countries) vegie burger. She is a great example to her parents, though she is partial to a few chippies. Whereas in Melbourne you can have a baby on your lap in a taxi, in Sydney a taxi driver can refuse to take you anywhere because by law a baby can only go in a taxi with a special baby seat. The same taxi driver can fail to check your baby's age and/or tell you that this law only applies to babies under 12 months old. Having a baby in tow makes it easier to be shameless about taking food from the downstairs buffet when overpriced room service food is rubbish. It is advisable to have some small tins of baked beans in suitcase for an even better alternative to room service. When feeding baked beans to baby in hotel room, even if dodgy highchair is brought to room, a towel on the ground underneath will be useful to deal with the mess of runaway beans. I wish I had been given this advice before dinner rather than after! 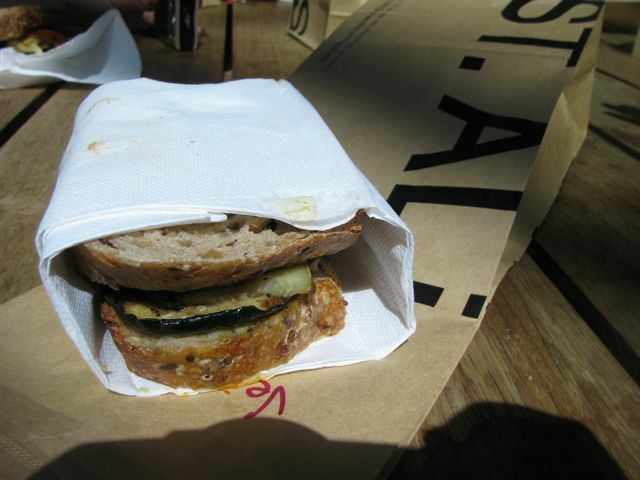 Don't rely on the cafe at the Museum of Sydney for feeding a vegetarian baby. Glebe is only a short 10-15 minute walk from Central Station. I will post about the lovely cafe we visited there later and tell you a little more about Glebe Point Road. The Opera House has only one lift as an alternative to walking up all the stairs to gaze at the beautiful building up close. E did an excellent job of carrying the stroller up the steps when we found the lift was out of order. Crawling around the airport while your plane is delayed is a great way to get a baby to sleep on the plane. Hurrah for finally figuring out how to put anchors in my recipe index for easier searching! Hurrah for an award from Jacqueline! Hurrah for Sylvia eating smoothies, sausages and sweets! 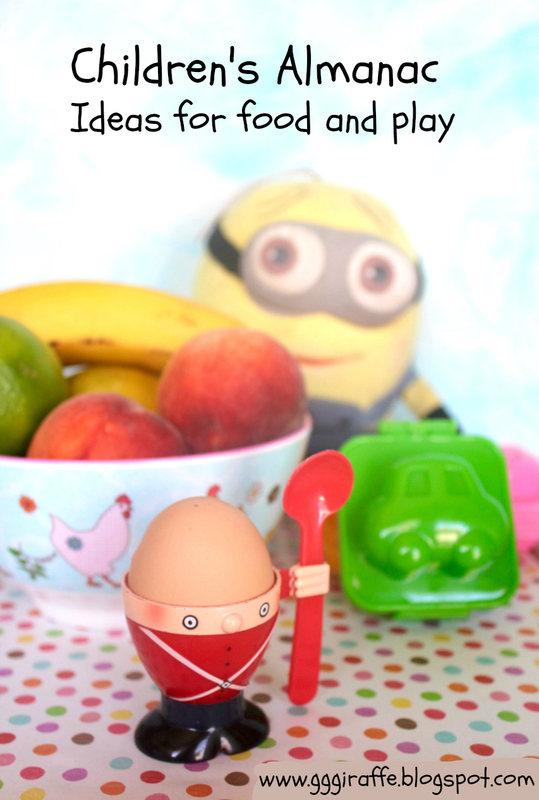 Hurrah for a happy positive start to this post even though I want to have a whinge! Last night I was planning to write up a post and was waylaid by the idea of putting anchors into my blog index. I found this post helpful for anyone who has also not known how to do it. Life has been busy as usual and so now that I have accomplished the anchors, I would catch up with some photos of good food we have eaten recently and a chat about having a vegetarian baby. ....This post has been coming together so slowly (two conferences in a week has left me with far too little blogging time and energy) that I also must thank Ricki for sending me an award. I was delighted to get an award back from two of my favourite bloggers. Both Jacqueline and Ricki have written up fantastic posts full of gorgeous photos, generous descriptions and lots of links to more interesting blogs that I must check out (if I can ever get on top of my backlog!!!). I love hearing little updates on Jacqueline's gorgeous baby Cooper and I know she will be interested to hear about Sylvia. Ricki is very sympathetic about food intolerances and also takes a great interest in my little one so here is a little update for both of them and for anyone else with an interest in rearing a vegetarian baby. Just before Sylvia had her first birthday we went to the maternal and child health nurse for her 12 month check. She asked me if I had any concerns. I said no. Maybe it was a trick question. By the time I had finished talking to her it seemed I should have many concerns about her diet. The nurse seemed quite horrified that she hadn't put on much weight and was no longer at the top of the chart with her weight despite still being above average weight. In retrospect I wish I had told the nurse that she was my main concern. I was made to feel that Sylvia was underfed and in danger of not developing well. But the nurse's irrational approach made me question how concerned I really should be. When I said that Sylvia didn't like milk and in fact I didn't like milk, she decided Sylvia was dairy intolerant. She told me I could try soy milk but I should be warned that she might be soy intolerant because about 50% of babies are. She obviously hadn't been listening when I had mentioned minutes before that Sylvia loves tofu. I came out feeling that the subtext was that my vegetarianism was just whacky and dangerous. I decided to discuss it with my doctor who started questioning where Sylvia got her iron. Again the implication was that I had to be very careful about her being a vegetarian baby. It was as though vegetarianism is a phase I have been going through (for almost 20 years!) and now it was time to grow up and eat meat. I bought the iron supplement that the doctor recommended and was unhappy to see that the second ingredient was sugar. Since then I have been on a mission to try and get Sylvia eating more and in particular more eggs and dairy. I have visited the doctor again who is actually quite nice and seems to think Sylvia is fine. But I resent that these health professionals have honed in on my vegetarianism rather than asking me why I think she might have put on so little weight and discussing with me how I might get her eating more. I am trying to give her more frequent meals as the doctor suggested but there is only so much of my day (and energy) that I can devote to Sylvia's mealtimes. It makes me angry that these health professionals who are meant to support parents bring up their babies are actually making us more paranoid and unhappy. Among my friends I have known people whose babies weigh too little, weigh too much, aren't walking early enough and aren't saying enough words. If they don't fit into a narrowly defined "normal", parents are made to feel there is a problem. The whole guilt trip for parents starts early with the foods that may be harmful in pregnancy and the midwives with their contradictions at the hospital straight after birth. Thank goodness for the common sense of mother's club chit chat about babies progressing at their own pace and parents ignoring charts based on bottle fed babies. 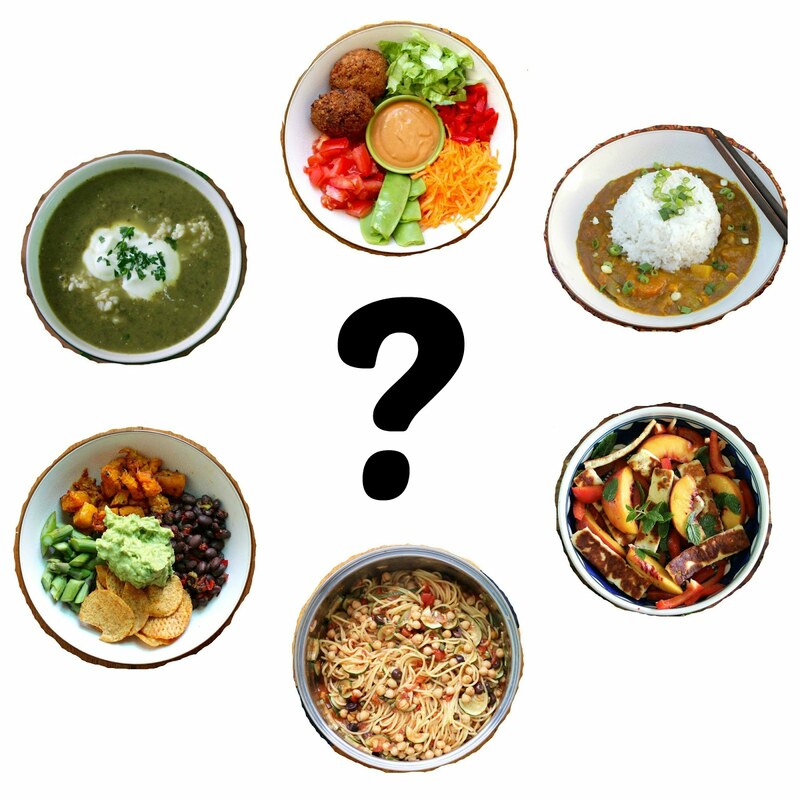 Bloggers can also help to reassure with useful information, such as Sophie's recent post on the benefits of tofu with regards to calcium intake. Nevertheless, I have been watching what Sylvia eats carefully. We have tried to get her eating more milk and eggs but it is not easy when it does not come naturally to me. 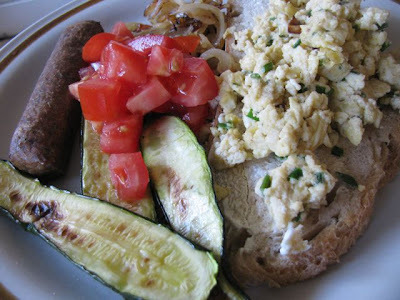 E is loving my attempts to make her scrambled eggs - something I would not normally make. Jules idea of adding creamed corn was great. It is a surprise to see that she eats it. Far easier for me is cheese. 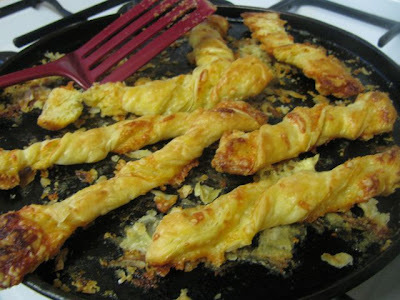 I was pleased to see her eating cheese straws inspired by Lorraine - if not as pretty (note to self, remember to use baking paper next time). She has also loved my creamy pumpkin dip on toast, loves vegetarian sausages and has tried some sausage rolls (I tried cindy's vegan version) but refused my adaptation of this lentil loaf. It was a bit dry. 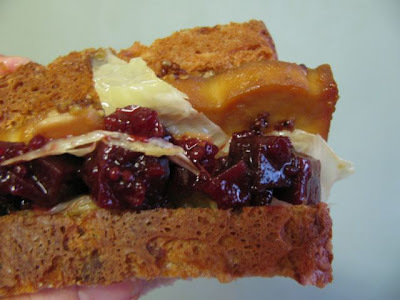 Never mind, I loved the loaf in a burger with tomato, onion and sauerkraut inspired by the Court Jester. As for milk, the very idea of drinking a glass of a stuff makes me shudder in horror. The doctor suggested smoothies which I love but she was even more impressed when I said that I had made bread and butter pudding. Obviously she expected it to be full of eggs and milk as did my mum when I discussed making it with her. My favourite one I have made to date is actually the very vegan friendly Pumpkin and chocolate bread pudding with no eggs. But I didn't mention that. I had told my mum that I wanted to put in some of the blood plums I had bought. She thought it sounded too fruity and suggested I use some of my plum jam. I did so because I wanted to make it like my mum had made it for me as a child. Strangely enough I had never thought of it as a healthy food but there you go. I used some panettone that I had been saving to make a summer pudding and the milk I had accidentally bought a day before the use by date. I gave it the full nostalgic treatment of coconut on top and served it with a little milk and sugar like my mum used to. It was delicious. Maybe it needs to be a regular health food in our house. If I didn't have panettone I think a good sourdough fruit loaf would suffice or else plain bread with some butter, sultanas and a little orange zest. When I said the blood plums had to be used, my mum said she would stew them for me. She was as good as her word. Stewed blood plums also make me think of my childhood. I used quite a few of them in smoothies for Sylvia. The combination is below. It took me a few attempts to get Sylvia drinking them but she has just learned to use a straw and sucking anything through a straw delights her, even smoothies. 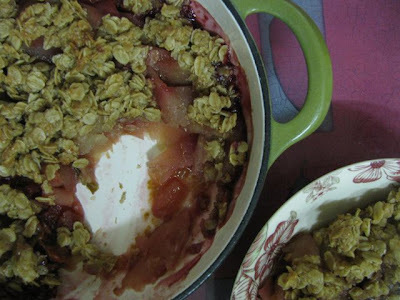 The rest of the plums went with some stewed apples (thanks again mum) into a crumble like this one that Sylvia also loved. So now that my rant is done, here are a couple of recipes, which are just written as I did them. 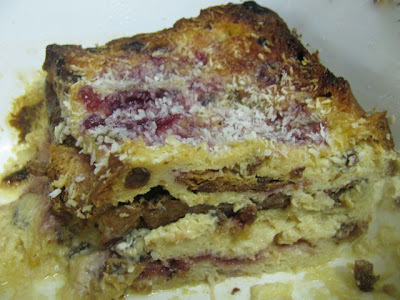 The bread and butter pudding goes to Susan for YeastSpotting. I don't always have plums and leftover condensed milk and unused panettone in my kitchen but if I did I wouldn't hesitate to make these again, baby or no baby! Blitz all ingredients in a blender til smooth. Pour and drink! 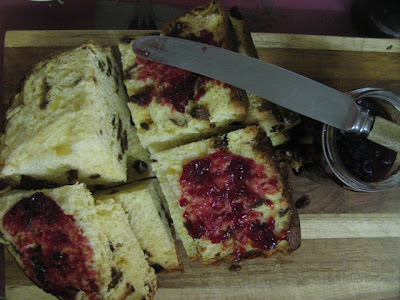 Spread panettone with plum jam. Layer in a greased casserole dish. Lightly whisk together milk, eggs and condensed milk and pour over panettone. Press down to make sure the panettone soaks up all the milk and egg mixture and leave to soak for at least 30 minutes. Sprinkle with coconut and bake at 180 for about 45 minutes or until top is golden brown and crispy. Sit at least 10 minutes before serving. You can serve it with a smidge of milk and a sprinkle of sugar if desired. It will keep overnight and taste even better the next day - I just heated it in the microwave. At the moment it feels like there are not enough hours in the day. I don't make as much food as I plan to, I struggle to find time to post on this blog about this cooking, and I don't find the time to comment on other blogs as much as I want. But once I do visit other blogs, I find myself sucked back into the world of wonderful foodie ideas that I must try and the cycle of cooking, posting and visiting blogs begins again. One blogger who often inspires is Heidi of 101 Cookbooks. I found myself adapting and pairing her recipes last week. I had some buckwheat soba noodles that I had bought to make a quick salad for the recent potluck. A few days after, I had a chance to make the salad. 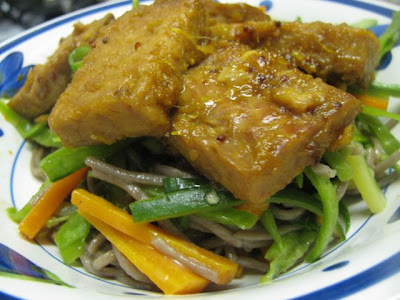 There are many soba noodle salad recipes on the web but as so I often happens, I found myself drawn to one of Heidi's recipes. I love her flavours but often add more vegetables. I made the salad one night after work. When I have been working all day Sylvia can be very clingy. So on this night I gave her a cuddle while instructing E on making the dressing. He had lots of fun being Captain Kirk playing with the ginger Phaser. (I had to check this on Wikipedia and couldn't believe the huge list of Star Trek weapons.) He was less enthused at measuring out honey. Sylvia was then calm enough for me to get the vegetables together and tweak the dressing. It was very spicy and I later wondered if E had put in enough honey. I enjoyed the salad that night but I think I loved it even more the next day when it has sat overnight in the creamy dressing. Being cautious I had only added tofu and tahini to half the dressing and boiled up half the soba noodles. The next night I chopped more vegies and cooked more noodles. It was equally good with the dressing, without tofu and tahini. I liked Heidi's suggestion of pan frying some tofu for the salad. But I had a slab of tempeh in the fridge that I had bought with the intention of revisiting a Heidi's Orange Glazed Tempeh. I had first made this a few weeks back and it was so good that E said it could fool (or satisfy) a carnivore. It was crispy and substantial and full of flavour. I had meant to serve it with brown rice but the weevils had beaten me to it. So I made a plain basmati rice salad with lime juice and vegetables to accompany it. As I was able to dig in, Sylvia fell over and began crying. I was hungry! So I sat on the floor with her while I ate. She had a lovely time sticking her hand into the rice and I was glad it was so plain. Maybe she recognised it as being similar to her meal of rice, vegies and beans. I would like to say that she ate a lot of mine but she was more interested in scattering it on the rug. I was more impressed at her steadiness as she stood beside me to reach into my bowl. The second time I made the dish the flavours were still delicious but I was a little impatient with the tempeh and didn't fry it long enough to be really crispy. It was nice but not as spectacular as the first time. A good lesson for me on frying up tempeh! I must try it again to do it properly again and remind myself of just how crispy it can be. 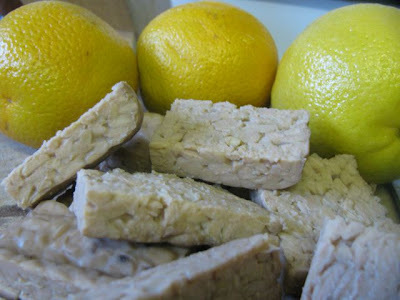 I am sending the Orange Glazed Tempeh to Mirch Masala who's hosting this month's My Legume Love Affair, the monthly event focusing on legumes, including soy based products such as tempeh and tofu, which is overseen by Susan of The Well Seasoned Cook. Make the dressing by whisking together all ingredients in a small bowl. If you chose to use the tofu and tahini it will be quite creamy but should keep overnight after being stirred into the salad. (I had some for lunch the next day and it was fantastic.) We also had a second lot of soba noodles with the dressing without tofu and tahini and that was very good too. Cook the soba in a large saucepan of lots of boiling salted water until just tender, then drain and rinse under cold running water. I would like to tell you to check the instructions on the packet but my packet didn't actually give a time - I think it took me about 5-10 minutes but I can't remember. I do remember that I used a small saucepan and they really needed to be stirred to separate them once the water boiled and a bigger saucepan with lots of room would have helped the noodles separate. I also put my carrot in with the noodles to cook a for a few minutes. While the noodles are cooking, prepare the vegies and firm tofu (if using). Heidi cooked her tofu in oil until 'bouncy'. 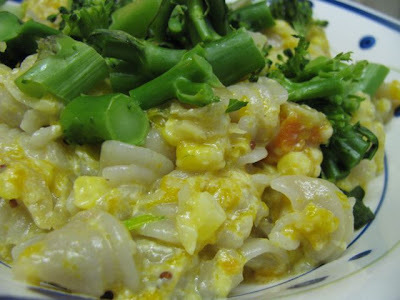 When noodles are cooked, toss with dressing and vegetables. 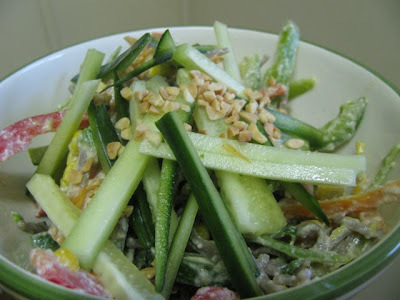 I kept the cucumber and chopped nuts aside to use as garnish once I had served the salad in bowls. 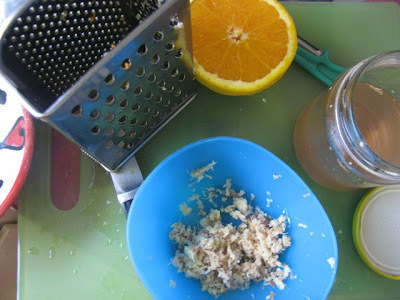 In a small bowl, place the orange juice, juice of the grated ginger, tamari, mirin, maple syrup, mustard, and garlic. Mix together and set aside. 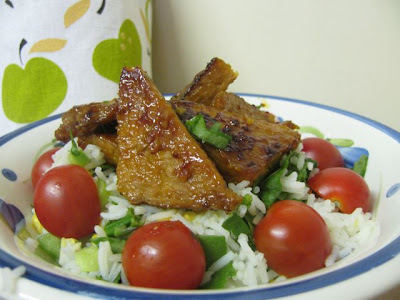 Slice the tempeh into bite sized pieces - I found that rectangles fit in my frypan easier than triangles although triangles are more pleasing. Heat a large frypan over medium heat and add oil to hot pan. Once oil has heated up (and it shouldn't take too long on a hot frypan) add tempeh and fry for 5 minutes or until it is golden brown underneath. Turn and cook on the other side for another 5 minutes until it is golden brown. It is important to make sure it is cooked to crispy golden brown for this dish to work. 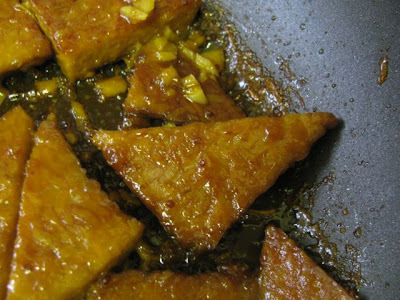 When tempeh is well cooked, pour orange juice mixture into pan and simmer for about 10 minutes or until the sauce has reduced into a syrupy glaze. Turn tempeh over once during this time and spoon sauce over it to ensure it is well coated. Serve over a grain, such as rice or noodles, and vegetables. Happy St Patrick’s Day! Some say it is just another day but I say it is a day to wear, eat and enjoy all things green. Having Irish-Anglo ancestors and being taught by an Irish order of nuns means that St Patrick’s day was always significant when I was growing up and it is especially significant now for my sister and her family who live in Dublin! One of the dilemmas about St Patrick's day food is that Irish food is not particularly green. Potato, cabbage and stout are not the greenest of foods. So the days seems to present an awkward choice between eating Irish food or green food. Today I will have the best of both worlds by posting some recent green salads and making an Irish dinner that I will blog later. 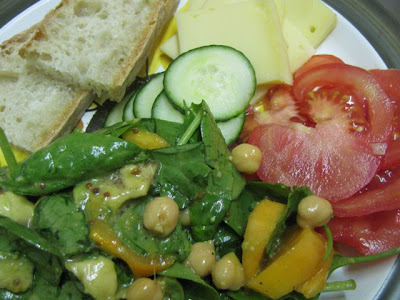 Today’s salads have lots of spinach and herbs but they actually were inspired by Lisa and Jacqueline’s monthly vegetarian soup and salad event, No Croutons Required, which is focused on chickpeas this month. I share Lisa’s love of chickpeas. The hardest thing about this event was choosing from lots of ideas. I tried three ideas. The first was inspired but didn’t quite work, the second gave me a chance to try an unusual ingredient and was very good but my favourite was the ad hoc salad I made last night. So let’s start at the beginning and let me tell you why the first salad didn’t work. I decided to make salad with cracked wheat because I was clearing out bags of grains that the weevils were eager to share. It was bought for recipes requiring kibbled wheat and I have always been a bit confused about if it is the same as bulgar wheat. I think it is but is a coarser grain. So I boiled it for about 15 minutes, added some vegetables and dressing but it didn't have enough flavour. What was best about the salad was the panfried chickpeas, fresh pineapple and microwaved pumpkin in olive oil with a tablespoon of balsamic vinegar thrown in at the end. 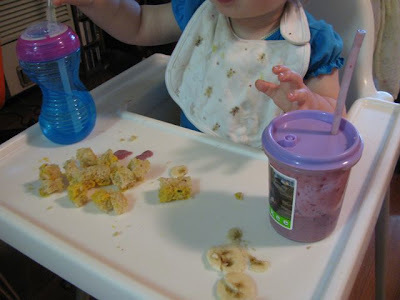 It was tangy, sweet and delicious but E didn’t like the pineapple. Then I saw a recipe on Cookin’ Canuck for Spinach Salad with Fuyu Persimmon, Jicama & Avocado with Miso Dressing. I had just bought a couple of persimmons without really knowing what to do with them or even what sort of persimmon they were. 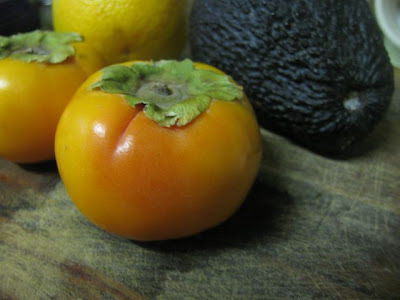 I know that Susan had a useful persimmon post at Food Blogga so I went there and found I had bought fuyu persimmons – the shorter squat ones that can be eaten firm or soft. I once ate an unripe Hachiya persimmon that a work colleague brought in from his tree and I swore never to go near the fruit again but fortunately I have found that fuyus are more friendly and don’t need to be soggy ripe to eat them. 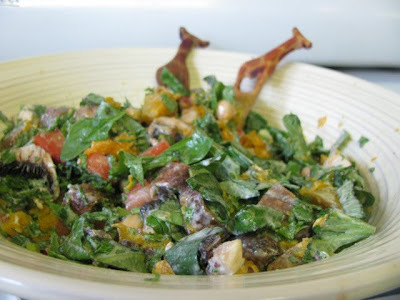 Susan also gave a great harvest salad recipe with a great orange dressing that I decided to use. So I had persimmons, but there was no chance of finding jimaca and I had to find a ripe avocado. I have taken to going to the Vic Market more often, now I am back at work so was able to find ripe avocados, though it is always a bit hit and miss till you open them. The one I bought was ok but no great so I only used half of it, which was probably enough. 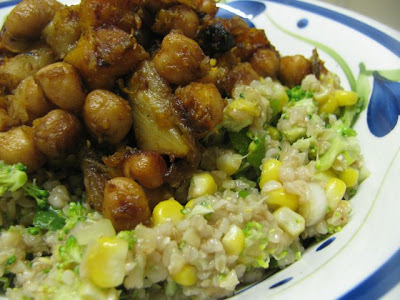 Instead of jimaca, I used chickpeas. E surprisingly said that he liked the persimmons more than other fruit I put in salads. I actually think it was because the dressing was so good. We ate it with no-knead bread, cheese, tomato and cucumber. A fine simple supper. Then last night I decided to make salad with what was in the fridge. Chickpeas, pumpkin and spinach with a simple tahini/lemon/yoghurt dressing is a favourite combination. So the salad was based on this with a little extra thrown in. It was one of those salads that just come together into a great meal more through intuition than planning. I loved this one and didn’t even need any bread with my meal. It occurred to me that this would be a good combination to bake in the oven with some spaghetti and a little tweaking of the dressing. Sylvia has been quite grizzly lately – a combination of teething and missing me while I am at work. I sat with her on the floor while I ate my dinner and she had a few bits off my plate – she loves the chickpeas and the sausage. The highlight of the meal was when she took her first step unaided. Being a foodie baby, her first step was reaching out for a piece of bread. Then she reverted to crawling about on all fours. But it is all the proof that I need that this salad will fill you with energy and put a smile on your face. 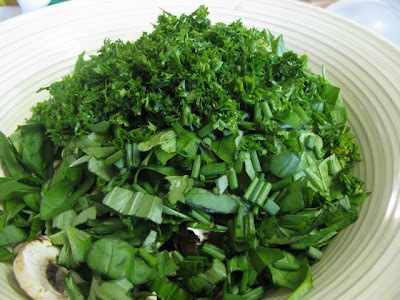 Arrange salad on shallow salad bowl. 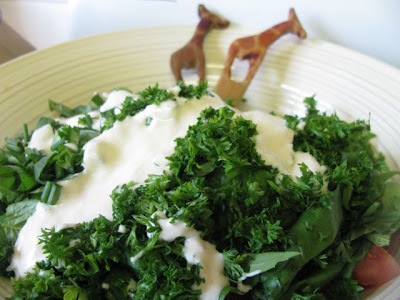 Lightly whisk the dressing ingredients together in a small bowl and drizzle over the salad. Toss and serve. Lightly whisk the dressing ingredients in a small bowl. 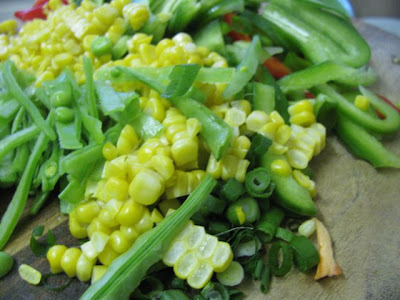 Place remaining ingredients in a large salad bowl and toss with the dressing til well coated. Serve at room temperature. We had this in one night but I think it would keep well overnight.